Are you yearning for deep, authentic connection? Can you imagine a loving community of people who care about each other and the Earth? Do you want to co-create a culture that is alive, embodied and free? 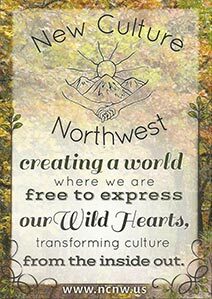 Join us for New Culture Cascadia Summer Camp and together let’s explore our creative edges, expand our comfort zone, and integrate our skills, knowledge and intuitions to co-create an experience that is unique, alive, and unforgettable. What is New Culture Summer Camp? New Culture Cascadia Summer Camp is 10 days of personal exploration, co-creating community, and embodying skills for a thriving, sustainable society — it isn’t quite like anything else we’ve seen! We invite top-notch presenters to help guide our explorations, and we live, work, learn and play together in the forests of Cascadia. CLICK HERE to read more details about camp. What would it take to harness the collective wisdom, resources and desires embodied in the New Culture community? As part of our theme for 2016 – Re-Imagining Culture – we are embracing the creativity and wisdom embodied in campers and empowering the awareness that together we hold the answers for how to transition from where we are to where we want to be. We are at a cultural edge, let’s support each other as we create a new path forward! We will have a cadre of talented presenters join us in our experiment as we open up the programming to respond directly to the desires of the community. What do YOU crave most? What do WE collectively desire? What new discovery will we uncover as we practice together being fully present in our bodies and in community? We’ll start with orientation and group experiences designed to help you tap into your desires and support deep connection. Then our team of visionary facilitators will guide us through a brief process to reveal what is alive and wanted most by the community for the week to come. The presenters and campers will work together to bring these desires to life. Schedule: Each day will include several New Culture favorites, including morning movement & circle to awaken the body and greet the day and ZEGG-style Forum to support, connection and transparency. We’ll be experimenting with new additions such as daily affinity groups that come together with a shared interest and are invited to make collaborative offerings to the camp as a whole. We’ll have 3 plenary workshops/play spaces each day that will be designed around YOUR desires for camp. Together we can cultivate connections, empower personal and social change, support healing, and explore love & freedom of choice. So come prepared to help co-create your camp experience! Contact us if you would like to help organize our events, or if you have suggestions for possible programs, or any other ideas to share with us!